Do You Need Fire Insurance for Your Home? Home > Fire Insurance > Do You Need Fire Insurance for Your Home? 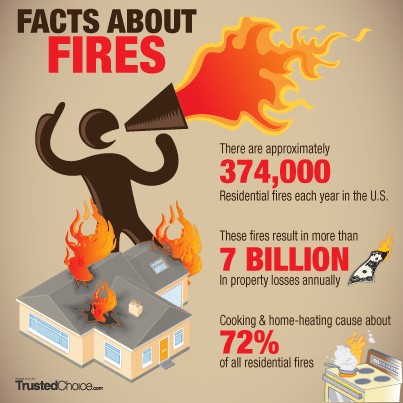 The National Fire Protection Agency reports that, on average, Americans experience a fire in their homes about once every five years. This number includes all accidental house fires, no matter how small. Most are put out quickly and result in little damage. However, fires can occasionally get out of control, and when they do, the damage is often significant. An independent insurance agent in the Trusted Choice® network like ours at Neely Taylor Wade Insurance can help you determine your coverage needs and can explain your options for dwelling fire insurance. Independent agents work for you, not for an insurance company, and they have taken a pledge to provide exceptional customer service and honest, ethical advice. It is a good idea to make an inventory of all your belongings and bring it with you when you meet with a Trusted Choice member agent. Most policies have caps on coverage for different kinds of belongings. If you own expensive items such as jewelry, artwork or electronics, you may need to purchase a separate rider that lists your valuable items and provides the additional coverage for them.